Assimp comes with CMakeLists. Would it not be possible to build the library targeting Android? Sure it does. There is an option to enable the ‘Android Port’ in CMAKE but it’s not clear how to set up the Android NDK, which is needed to compile Android libraries. If you have a look at the two articles I mentioned (http://scriptogr.am/phnguyen/post/assimp-on-desktop-and-mobile and http://www.myandroidonline.com/2015/06/09/compile-assimp-open-source-library-for-android ) they both mention to use the android.toolchain.cmake (downloadable from GitGub from here https://github.com/taka-no-me/android-cmake/archive/master.zip ) with CMAKE. I had the same problem with shared library and your post was very helpful to fix my issue. By the way, can you start the application with debugger? After adding the java code, it keeps failing to start with debugger. Hi there! Thanks for reading my article and for finding it helpful. The only case where the debugger won’t start (in my experience) is when you run the program in Release mode. In that case no matter what, Visual Studio won’t be able to attach the debugger to the process. Other than that yes I’m able to debug on the phone too. If you have errors you might want to look at the LogCat, there might be errors there that you are not noticing. One good thing is to put a breakpoint in the Java code too (works for me). It could be the loading of the shared library that is failing. Can you elaborate on this. I’m not sure what my package layout is? (I’m a c coder) do I make up a directory and put my file here “src\com\your\Loader.java” also where do I put this in relation to my vcproj file? best thing is to create your folder structure inside Visual Studio, and put your Loader.java exactly in a location that matches your package declaration (i.e. the namespace) . 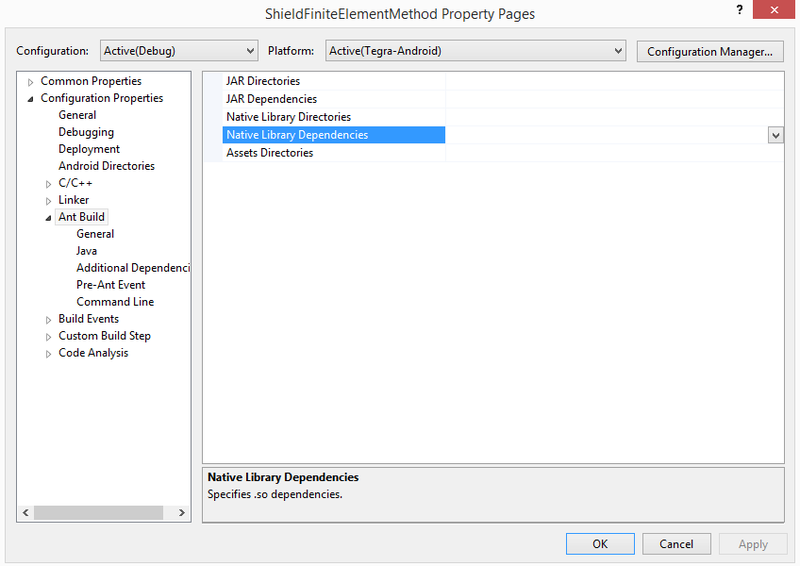 When you deploy everything to Android, if you follow my guide and change the androidmanifest.xml you should be able to load your library.